YouTube, which has always had an ad-based business model, is considering pay walls for their premium content channels. The company is interested in creating a subscription-based models where YouTube publishers would charge viewers a monthly fee for the right to watch content, much like what Hulu currently does. It's just a rumor at this point, but AdAge is reporting that the company has reached out to channel producers and asked them to submit applications to create paid content channels, which would cost as little as $1 a month. So far, we don't know which channel partners YouTube is interested in collaborating with, but the answer is most likely the content creators who are already bringing lots of traffic to the site – networks like Machinima, Maker Studios and Fullscreen. YouTube CEO has even bigger ambitions to bring the equivalent of cable channel networks to the site; ones which catered to too small a niche to succeed on TV. The new experiment will likely roll out on a very small scale, initially, with about 25 partners. 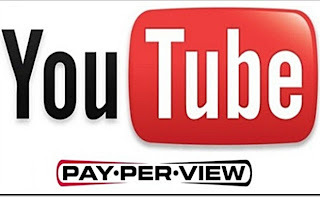 I think it would be best if YouTube worked with big-names like HBO to offer their episodes on a pay-per-view basis. But lesser-known publishers would risk alienating their core fans with a pricey subscription fee. What kind of content would you be willing to pay to watch on YouTube?